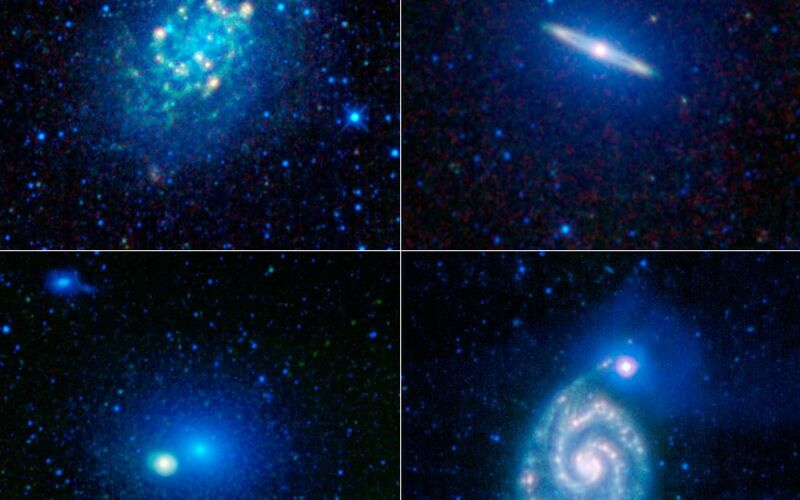 To celebrate the one-year anniversary of the launch of NASA's Wide-Field Infrared Explorer, or WISE, the mission team has put together this image showing just a sample of the millions of galaxies that have been imaged by WISE during its survey of the entire sky. NGC 300 is seen in the image in the upper left panel. This is a textbook spiral galaxy. 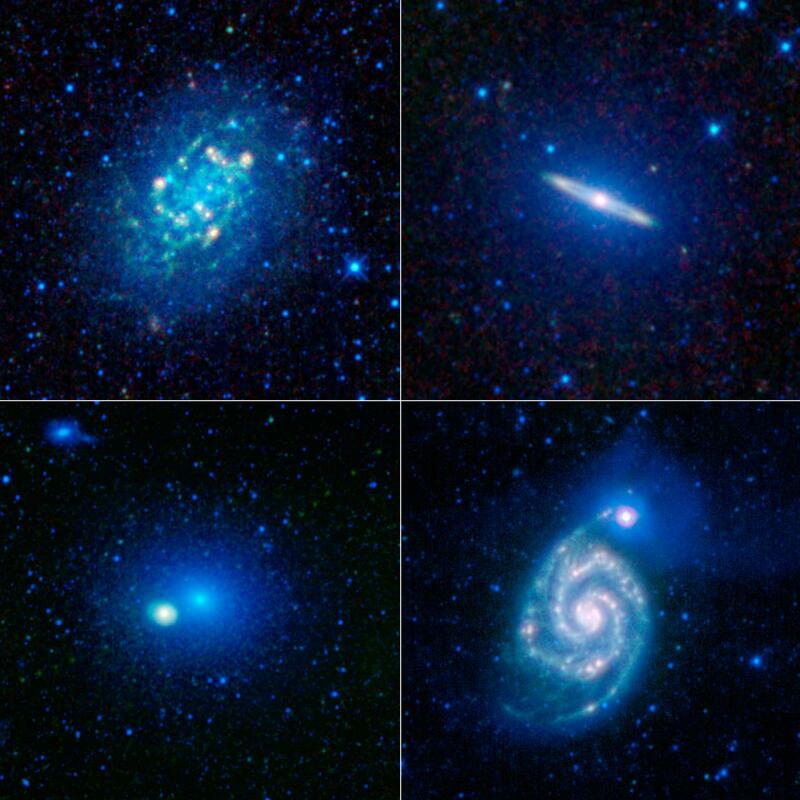 In fact, it is such a good representation of a spiral galaxy that astronomers have studied it in great detail to learn about the structure of all spirals in general. Infrared images like this one from WISE show astronomers where areas of gas and warm dust are concentrated -- features that cannot be seen in visible light. This gas and dust is primarily found near star-forming regions in the spiral arms. There isn't a significant amount of gas and dust in the central core in this type of spiral galaxy, so it appears relatively dim. At about 39,000 light-years across, NGC 300 is only about 40 percent the size of the Milky Way galaxy. The upper right image shows Messier 104, or M104, also known as the Sombrero galaxy. Although M104 is also classified as a spiral galaxy, it has a very different appearance than NGC 300. In part, this is because the dusty, star-forming spiral disk in M104 is seen nearly edge-on from our point of view. M104 also has a large, ball-shaped bulge component of older stars, seen here in blue. In visible light, a dark dust lane extends across the galaxy, blocking out some of the bright starlight in the disk behind it, and causing it to resemble a sombrero. This dust lane encircles the entire galaxy and glows brightly in infrared; it is seen here as bright circle surrounding a dense galactic core. The large, fuzzy grouping of stars at the center of the lower left panel is the galaxy Messier 60, or M60. 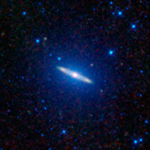 This galaxy does not have a spiral disk, just a bulge, making it a massive elliptical galaxy. 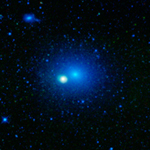 M60 is about 20 percent larger than the Milky Way galaxy, and lies in the Virgo cluster of galaxies. 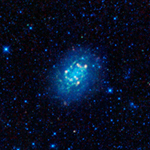 The brighter dense spot inside but off-center from the blue core of M60 is a separate spiral galaxy called NGC 4647. In visible light, M60 is much brighter than NGC 4647. However, in the longest infrared wavelengths that WISE sees, the opposite is true. Recent evidence suggests there is a black hole at the center of M60 with a mass of about 4.5 billion times that of the sun, making it one of the largest black holes known. Two more galaxies are near the upper left corner of this panel, NGC 4638 (the brighter one) and NGC 4637. In addition, two different asteroids were caught crossing the field of view when WISE imaged this portion of the sky (seen as dotted green lines extending out from M60 at about the 2 o'clock and 8 o'clock positions). The galaxy in the lower right panel is Messier 51, or NGC 5194, also frequently referred to as the Whirlpool galaxy. The Whirlpool is a "grand design" spiral galaxy. It is interacting with its smaller companion -- NGC 5195, a dwarf galaxy, which can be seen as a bright spot near the tip of the spiral arm extending up and to the right of the larger galaxy. 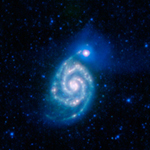 The Whirpool's very bright spiral arms show areas of compressed dust and gas. These arms have been enhanced by the recent encounter with NGC 5195. 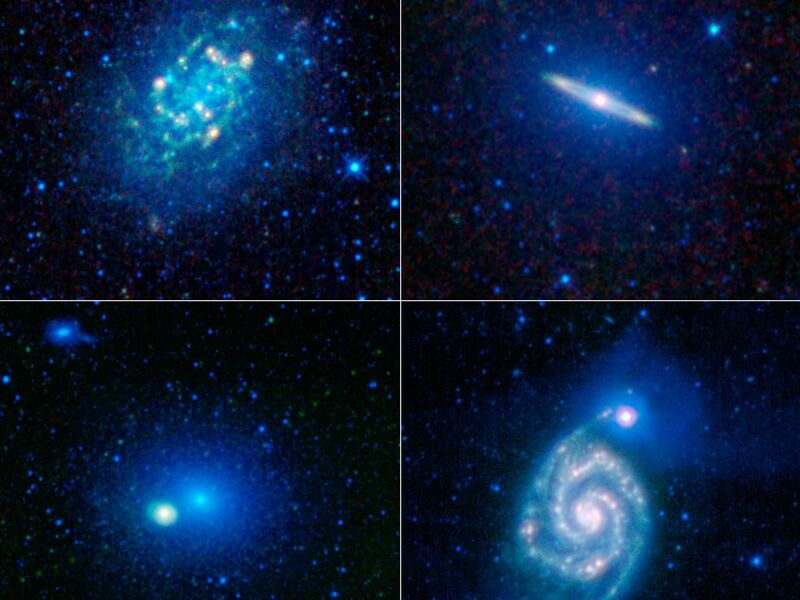 These images were made from observations by all four infrared detectors aboard WISE. Blue and cyan represent infrared light at wavelengths of 3.4 and 4.6 microns, which is primarily light from stars. Green and red represent light at 12 and 22 microns, which is primarily light emitted from warm dust. WISE launched into space aboard a Delta II rocket on Dec. 14, 2009, from Vandenberg Air Force Base, Calif.